I am always looking for fun things to do with my little man, who is 6. I've also wanted to have him try some music lessons, but he's really too young (and too wiggly) for traditional piano lessons. I play the piano, but I knew Isaac wasn't ready for sitting down with me at the piano to learn with the piano books I could find at the music store. 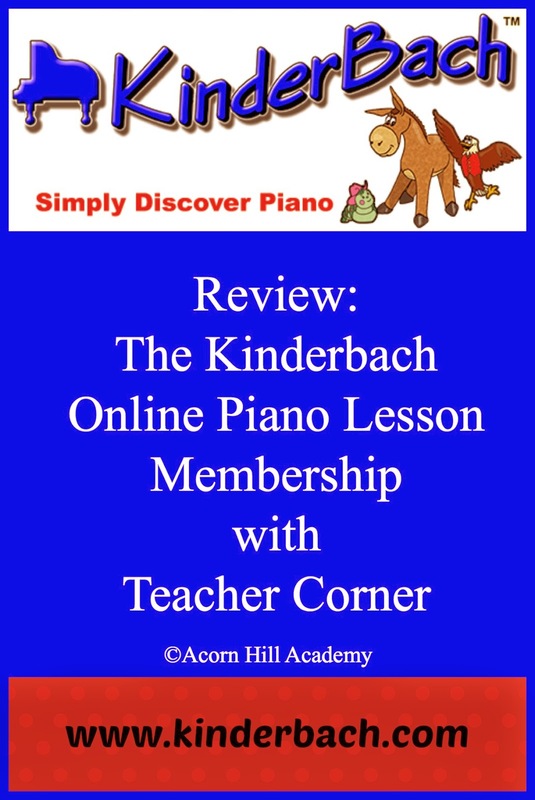 I was delighted to have the opportunity to review the KinderBach Online Piano Lesson Membership with Teacher Corner, meant for children ages 3-7, to see how he liked it. I received a 6-month subscription for us to try. There are currently 6 levels with a total of 240 lessons available, with more coming. Let me tell you - this program from KinderBach has been a huge hit! Karri Gregor, the author, clearly knows young children, because there is very little sitting involved, and lots of FUN in these early music lessons! Each video lesson is between 3-4 minutes long, and if there is any coloring or other activity to do, it's done during the video. There are pictures associated with the concepts, like a little house for Dodi the Donkey, who lives over the two black keys on a keyboard, and the Beat Bugs, who help introduce counting beats per measure. There are songs to sing, and MOTIONS to do. We were standing up tall for high notes, squatting down low for low notes, and hanging out in the middle for middle notes. Isaac loved it, and wanted to do a week's worth of lessons each time! In our short time using the program, I've heard him clapping along with songs in the car to the beat - that's a pretty big improvement. We used my iPad Mini to watch the videos, and that worked out very well for us. There are printable workbooks to go along with each level, and we printed off the Level 1 book to have ready when we did our lessons. You can see the printer icon in the image of the lesson screen, which also makes it simple to print the page you need when you open the lesson, if that works better for you. There are lots of fun activities that go along with this program, and if you have children who like to do that kind of thing, you will be able to have lots of fun. Isaac enjoyed the video lessons, but wasn't terribly interested in the activities. He did agree to do some of the coloring, but would only do what was absolutely necessary. I was tempted to print and laminate many things, but resisted the urge, because I knew we wouldn't use them. My girls would have loved all that stuff at this age, though. We did most of our lessons at the piano, and kept our crayons handy over there. When the lessons required a keyboard, Miss Karri told us right at the beginning. One of the best parts of this program was Isaac getting to play a song right away (by week 3). Also, even though I let him go through several lessons at once, there is a lot of review throughout the program, so I didn't worry about him missing something. We could always go back and review a lesson. 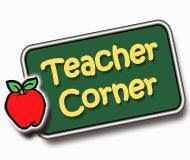 The Teacher Corner contains lesson plans for each level, along with the Teacher Guide, which includes lots of activities to go along with Levels 1-3; Audio MP3s for all the songs; and links to download the student books. 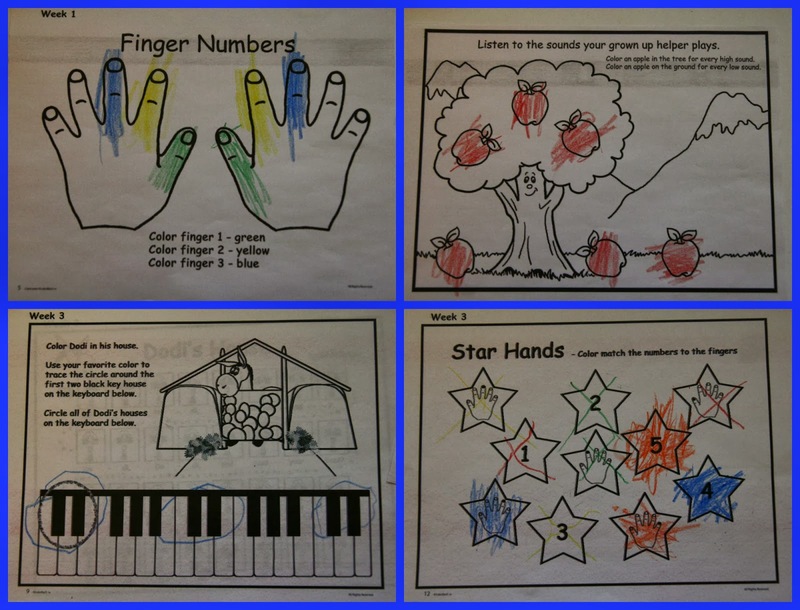 Additionally, you will find a storybook, coloring pages, and song books with additional music to use with students. The resources in the Teacher Corner are really intended for use in a classroom setting, but there are lots of fun activities in there, like puzzles and games, etc. that you could print and use at home, too. I could see those being VERY helpful if you had lots of little people trying to do the same lesson. The only thing I noticed about streaming the videos is that they have to stay pretty small in order to be good quality. They were all right on my iPad, but they wouldn't have looked very good on my full-sized monitor. There is an iPad app which puts all the lessons right at your fingertips - the app itself is free, and you can try the first two lessons of Level 1, but after that you have to purchase more lessons. There doesn't seem to be a way to log in to your KinderBach account and use your subscription through the app. 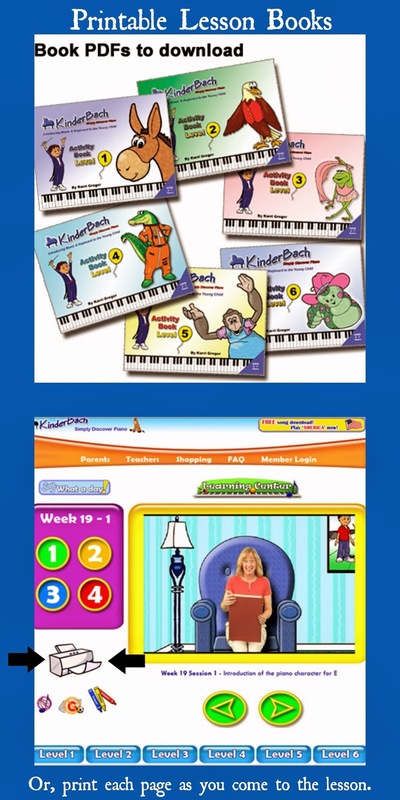 KinderBach is currently offering their Online Piano Lessons with Teacher Corner Membership for $95.88 per year, which works out to $7.99 per month for full access to levels 1-6 and all corresponding materials. If you've ever paid for music lessons, you know that's a great deal - and it's for any and all children in your family who might want to use it. I love having this resource for homeschool music lessons - one less thing that requires me to leave the house! You can try two weeks of lessons for FREE to see how you like it! If you'd like to know more about KinderBach, you can find them on Facebook (Facebook for Teachers, too), Pinterest, Twitter, and YouTube. This sounds really fun. My daughter is 5 and I think she would enjoy this. That sounds like such a great program! 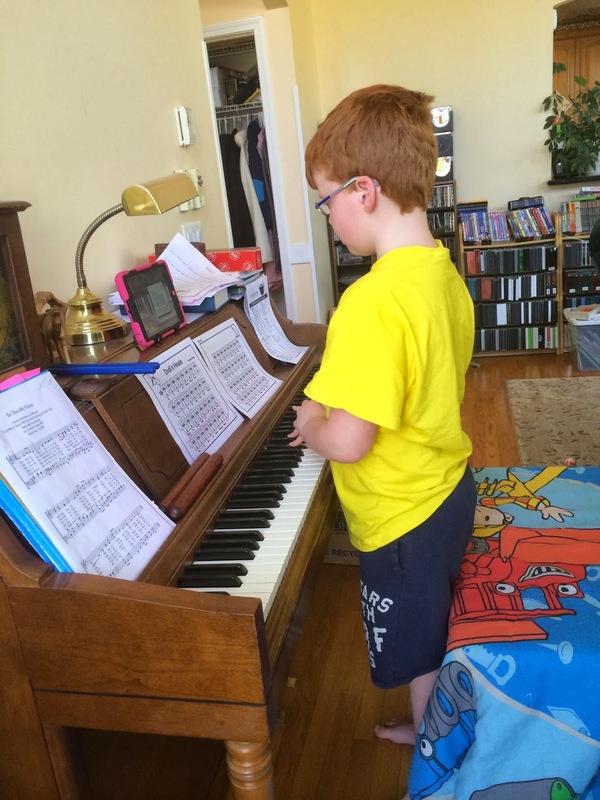 I cannot wait until my children are old enough to start taking a few music lessons but since they are currently 5 months and 2 we will be waiting a bit longer :) Thank you for sharing this! I'll have to look into it for sure! We have been waiting for lessons because we have a wiggly one to! This was a great fit for him!